No-one can fail to see the reality of human sin: all we need to do is to turn on the television or the radio or open a newspaper and see just what terrible things human beings can do to each other and themselves. As part of the his proclamation of the Kingdom, Jesus has to tell his disciples what will happen – he will be taken and accused, tortured and mistreated, and killed, but also rise again so that we may know that death is not the end, that our earthly life is not all that there is. It should come as no surprise that faced with this the apostle Peter cannot take it in – he does not want it to happen. It’s a human response – we do not want such a thing to take place, it’s horrible, it appals us. As Jesus says to Peter, ‘You are setting your mind on human things not divine things’. The Cross is inevitable for the simple reason that God loves us that much. As Christians, those who follow Christ, we are to take up our Cross and follow him. In the Letter to the Romans, St Paul describes what love looks like in action – it is how we put our faith, what we believe, into practice in our lives – by living out the love and forgiveness which we have received, turning from the ways of the world but rather following the way of God. We should be under no illusion; it isn’t easy following the way of the Cross. We cannot do it on our own, we have to do it together, as a community, relying upon God – loving and forgiving each other. All the power, all the wealth in the world is worth nothing compared to finding true life in Christ. These worldly things cannot save us, they cannot give us eternal life, they cannot deal with human sin – only Jesus can do this. Only in Christ can we have life and life in its fullness. Only if we lose our life by following him, can we find what our human life can be. Thus, the church in following Jesus, offers a radical alternative to the ways of selfishness and sin, a radical alternative which has the power to change the world through being conformed to Christ. We can do this together, by living out our faith and encouraging others to do so, living out an example of radical love which is difficult and costly and wonderful. We do it through prayer, through our conversation with God, listening to God, we are nourished by the Word of God, the Bible, to know that God loves us, and how are to live out that love and forgiveness in our lives. We are nourished by the sacraments of the Church, by Holy Communion, so that the love which God shows to the world on the Cross can continue to be poured out upon us, so that we can be strengthened to live out the life of faith. It is food for our souls, so that we may be built up in love. Let us come to him, to be fed by him, fed with him, to have new life in him, so that he can continue to transform our human nature and conform us to his example. Let us take our Cross, as people ransomed, healed, restored and forgiven by the love of God on the Cross. Endeavour to become humble and simple as a little child for love of the Lord, in imitation of him, and in a spirit of peace and recollection. If God finds this humility in us he will prosper his work in us himself. Persevere in being faithful to grace for the greater glory of God and for the pure love of him. All consists in loving well, and with all your heart and in all your employments, this God of all goodness. When God grants us attractions and sensible devotions let us profit by them to attach ourselves more firmly to him above all his gifts. But in times of dryness let us go on always in the same way, reminding ourselves of our poverty and also thinking that, perhaps, God wishes to prove our love for him by these salutary trials. Let us be humble, occupied in correcting our own faults, without reflecting on those of others. Let us see Jesus Christ in our neighbours, and then we shall have no difficulty in excusing them as well as helping them. Besides, we must bear with ourselves also out of charity. St Bartholomew is usually identified with the apostle Nathaniel, best known from his appearance in the first chapter of John’s Gospel when he asks, ‘Can anything good come out of Nazareth?’ and to whom Our Lord says, ‘Behold an Israelite in whom there is no guile.’ After Pentecost tradition holds that he went East; taking the Good News to Armenia or even India, and was martyred by being flayed alive. He told people about Jesus and suffered a painful death for the sake of the Kingdom. He bore witness to the truth of Jesus’ life and resurrection, and lit a flame which burns to this day. We would not be here, doing what we do, believing what we do, and encouraging others so to do if it were not for the example and witness of people like St Bartholomew who preferred nothing to Christ, who was the very centre of their lives, who gave them meaning and purpose, and who told others so that they might believe and encourage others so to do. In this morning’s Gospel we are presented with a challenging scene: it’s during the Last Supper, where Jesus takes bread and wine to feed his disciples with his Body and Blood, to explain what is about to happen, that he who was without sin might become sin so that we might have life, and life in all its fullness. In the midst of this we see the disciples arguing about who is the greatest. During the most momentous events of human history Our Lord’s closest friends are engaged in a squabble which seems childish and stupid, ‘I’m better than you’ ‘No I’m better than you’. Rather than being close to their Lord they’re involved in petty one-upmanship, thinking about themselves, about honour and position. It’s remarkably human, we can well imagine ourselves saying and doing exactly the same – we know it’s wrong, and we need to turn away from it. Rather than explode with anger, Our Lord makes a simple point ‘The kings of the Gentiles lord it over them; and those in authority over them are called benefactors. But not so with you; rather the greatest among you must become like the youngest, and the leader like one who serves. For who is greater, the one who is at the table or the one who serves? Is it not the one at the table? But I am among you as one who serves.’ In Christianity we have a different paradigm of leadership, that of the servant – here worldly values are turned on their head – the Kingdom offers an entirely different way of life, diametrically opposed to the ways of the world, something radical, something transformative, something which offers the world an entirely new way of living, where the service of others is seen as the most important thing. This is not power in worldly terms, the Creator and Redeemer of all humanity takes on a servile role – the greatest becomes the least, and encourages others to do likewise. Thus, rather than worrying about worldly power the disciples become servants, looking and acting like Jesus, they become transparent so that the light of Christ may shine through them in the world, so that their acts of loving service proclaim the truth, the beauty, and the goodness of the Kingdom. They go from worrying about power and position, the things of this world, to being concerned wholly with the Kingdom of God. We need to do the same, nothing more, nothing less. In our baptism we put on Christ, we were clothed with Him, we shared in His Death and Resurrection, and were filled with grace and the Holy Spirit, so that we might follow Him, and encourage others so to do. We have everything we need to follow in the footsteps of the Apostles. We too are fed with the Body and Blood of Christ so that we might have life in Him, so that we can give our lives to proclaim Him to the world. As Christians we need to live lives of service, the service of others and of the God who loves us and who saves us. We need to live out a radical alternative in the world, and for the world, to embody an alternative to the ways of selfishness and sin, proclaiming the Good News of Jesus Christ, and helping others to enter into the joy of the Lord. We need to do this together, serving and loving each other, forgiving each other, bearing witness in the world, not conformed to it, so that it may believe and give glory to God the Father, God the son, and God the Holy Spirit, to who whom be ascribed as is most right and just, all might, majesty, glory, dominion and power, now and forever. Judgement would hold nothing but terror for us if we had no hope of forgiveness. And the gift of forgiveness itself is implicit in God’s and people’s love. Yet it is not enough to be granted forgiveness, we must be prepared to receive it, to accept it. We must consent to be forgiven by a daring faith and generous hope, welcome the gift humbly, as a miracle which love alone, love human and divine, can work, and be forever grateful for its gratuity, its restoring, healing reintegrating power. We must never confuse forgiving with forgetting, or imagine that these two things go together. Not only do they not belong together, but they are mutually exclusive. to wipe out the past has little to do with constructive, imaginative, fruitful forgiveness; the only thing that must go, be erased from the past, is its venom; the bitterness, the resentment, the estrangement; but not the memory. Our Lord and Saviour, Jesus Christ was never afraid to court controversy, or indeed to challenge a religious hierarchy. Generally speaking it’s the Pharisees who tend to get both barrels so to speak. Jesus has a problem with hypocrisy: when what we say and what we do don’t match up. The Pharisees are so concerned with outward conformity to the letter of the Law of Moses that they have forgotten what the spirit is. While they stress the need for outward purity in terms of hand-washing, they need to remember that what is far worse is how what people think and say and do affects who and what they are. In their rigid outward conformity they have forgotten that at a fundamental level the Law of Moses needs affect our lives and to be lived out. It is a great challenge to each and every one of us to live up to this. It is both simple and difficult, and something which we all need to do together, as a community, so that we can support each other, and help each other to live out our faith in our lives. Otherwise we are the blind leading the blind, valuing outward conformity over the conversion of the soul, more concerned with appearance than reality and making a mockery of God and religion. It is an easy trap into which we can and do fall, so let us be vigilant and encourage each other not to fall into it, and to help each other out when we do. Likewise the healing of the daughter of the Syro-Phoenecian woman can appear to be troubling at ﬁrst: the Kingdom which Jesus comes to inaugurate is meant to be a place of healing, so its initial absence is troubling. The disciples can only see the woman as a troublesome annoyance, she’s making a fuss. Jesus begins by saying that he has not come to help her – his mission is save the lost sheep of Israel. So she begs him, ‘Lord help me’ His reply, ‘It is not fair to take the children’s food and throw it to the dogs’ can seem at a superficial level to be rude and dismissive. Yet it elicits the following response: ‘Yes, Lord, yet even the dogs eat the crumbs that fall from their masters’ table.’ To which Jesus replies ‘Woman, great is your faith! Let it be done for you as you wish.’ The girl is healed through the power of God, but Jesus’ initial withholding seems to be designed to show the centrality of faith in God as a prerequisite for the pouring out of God’s healing love upon the world. As opposed to the exclusive view of Jesus’ mission being only to Jews, we see in this miracle that God’s healing love is for all, and the Gospel, the Good News of Christ, is for everyone, and that if we have faith, if we trust God to be at work in our lives then we will not be disappointed. We can put our trust in a God who loves us, who heals us, and who saves us, who offers freedom, healing and salvation for all, and who spared not His only Son for love of us. As we are fed and nourished with the Word of God, and with the Sacrament of His Body and Blood, so that the healing love of God may be poured out upon us, to restore us, to strengthen us to live out our faith together, not in outward conformity, keeping up appearances, for the sake of propriety, but so that we can be healed, and helped to live out our faith together. Let us enter into the joy of the Lord, and encourage others to do so, so that they too may believe and give glory to God the Father, God the son, and God the Holy Spirit, to who whom be ascribed as is most right and just, all might, majesty, glory, dominion and power, now and forever. Picture the scene: Jesus has just been told that his cousin, John the Baptist, has been put in prison and killed, he himself has just been to Nazareth, where he was rejected, by the very people who should have accepted him. The atmosphere is tense, is he safe, will he too be arrested and killed? It is not for nothing that this morning’s Gospel passage begins with Jesus withdrawing to the desert – to be alone, to pray, to be close to God. When the people hear where he has gone they follow him, they walk out from the towns into the desert, they can’t just cross the lake, they want to see him, and to hear him teach them. When he gets out of the boat he sees a great mass of people and he has compassion on them, he is moved by the sight of them, and their need. He heals the sick to show that the Kingdom of God is a place of healing, where humanity can be restored through an encounter with the divine. His actions as well as his words proclaim the power of God to heal and restore humanity. Despite the danger, his concern is for others. It is getting late, the sun is fast moving towards the West, and the disciples tell him to send the crowds away so that they can buy food, instead Jesus says that they do not need to go away, and tells the disciples to give them something to eat. The disciples obey him, but cannot see how five loaves and two fish can possibly feed the thousands of people who are out there to be close to Jesus. The five loaves are the five books of Moses, the Pentateuch, Genesis, Exodus, Leviticus, Numbers, Deuteronomy, the Books of the Law, the Torah, which show Israel how to live, and how to love God. 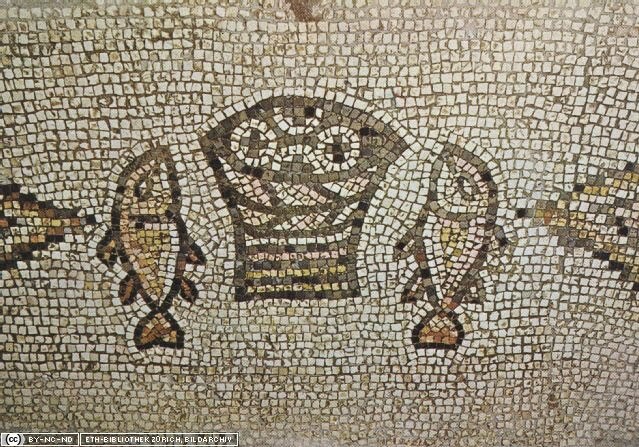 The two fish are the Law and the Prophets, so that man shall not live by bread alone, but by every word that proceeds from the mouth of God. The law and the Prophets point to Jesus, the Word made flesh: they find their fulfilment and true meaning in Him. The hopes of Israel, for the future, for a Messiah, are fulfilled in Him. Just like Israel after crossing the Red Sea here the People of God are fed by God in the desert. There is so much food left over at the end that there is enough to fill twelve baskets, one for each of the disciples. What in human terms – five loaves and two fish – isn’t enough, is more than sufficient in divine terms, just like at the Wedding feast in Cana, here we see that the Kingdom of God is a place of joy and abundance, of generosity, which isn’t concerned with scrimping or with the ‘good enough’, it is a place of lavish excess. This is what the church is supposed to be like – this is meant to be the model for our lives as Christians. The multiplication of the loaves is then not some conjuring trick, meant to amaze us, or to show us how powerful God is, but a sign of God’s generous love for humanity – it is what God does for us, so that we can respond to it in a profound and radical way and thereby change the world. Jesus has been rejected by the people of Nazareth and he responds by feeding people until they are satisfied, they’ve had enough, and there’s still loads left over. Likewise God’s love and mercy are inexhaustible, and are shown to the world, and poured out upon the world in Jesus Christ and in his death upon the Cross for our salvation. καὶ καθὼς Μωϋσῆς ὕψωσεν τὸν ὄφιν ἐν τῇ ἐρήμῳ, οὕτως ὑψωθῆναι δεῖ τὸν υἱὸν τοῦ ἀνθρώπου, ἵνα πᾶς ὁ πιστεύων ἐν αὐτῷ ἔχῃ ζωὴν αἰώνιον. Οὕτως γὰρ ἠγάπησεν ὁ θεὸς τὸν κόσμον ὥστε τὸν υἱὸν τὸν μονογενῆ ἔδωκεν, ἵνα πᾶς ὁ πιστεύων εἰς αὐτὸν μὴ ἀπόληται ἀλλὰ ἔχῃ ζωὴν αἰώνιον. οὐ γὰρ ἀπέστειλεν ὁ θεὸς τὸν υἱὸν εἰς τὸν κόσμον ἵνα κρίνῃ τὸν κόσμον, ἀλλ’ ἵνα σωθῇ ὁ κόσμος δι’ αὐτοῦ. It is this self same sacrifice which Jesus, on the night before he died told his disciples to carry on doing in remembrance of him, so that the Church could continue to be fed by him and fed with him, as a sign of his love for us, so that we might have life and forgiveness in him. This then is our soul’s true food, our foretaste of heaven, our pledge of future glory, given to us so that we might have life in Him and have it to the full. Let us come to be fed with the living bread, the bread which came down from heaven, so that it may feed our souls, so that we can be healed and restored by him. Let us be moved by the lavish generosity of God, and encouraged to live it out in our lives, in our thoughts, our words, and our actions, so that all that we are, all that we say or think or do, will proclaim the truth of God’s saving love to the world, so that it too may enter into the joy of the Lord and come to the banquet of the Kingdom, where all are welcomed, and healed. The invitation is there, and as the baptised, those who are in Christ, we are to welcome others. God takes us, like the bread and the fish, and blesses us, so that we can can fulfil his will in our lives. Filled with his grace, we encourage others to share in it, so that they may believe and give glory to God the Father, God the Son, and God the Holy Spirit, to who whom be ascribed as is most right and just, all might, majesty, glory, dominion and power, now and forever.